Reta D. Reed, 84, of Richville, died on January 13, 2015 at Gouverneur Hospital. There will be a graveside service on May 9, 2015, 10:00 am at Maple Grove Cemetery, Richville, Pastor Karen Taylor officiating. She is survived by her husband Paul R. Reed, sons Dorwin and his wife Pamela Gore of Gouverneur, Richard and his wife Colleen Reed of Gouverneur, Roger and his wife Donna Reed of Canton, a daughter Amy Jo and her husband Michael Weil of Potsdam, a sister June and her husband Keith Walrath of Gouverneur, grandchildren, Jamie Varney, Alexander Weil, T.J. Gore, Bethany Gore, Christopher Reed, Jason Reed, Travis Reed, Ashley Constance, and Connor Reed, great grandchildren, Holden Varney and Lia Constance, several nieces and nephews. She was predeceased by a sister Marion Woods. 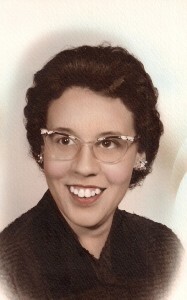 Reta was born on May 20, 1930 in Nicholville, New York, the daughter of Ernest and Dorothy Briggs Durant. She graduated from Gouverneur Central School, and Rome School of Business. She married H. Dorwin Gore in 1948, he died in 1960, and then she married Paul Reed on February 6, 1961, Rev. Brown officiating at the parsonage. Reta was an administrative assistant at BOCES Southwest Tech., Fowler, prior to that she worked for Gouverneur High School as a secretary of the Health and Athletic Department, Gouverneur Savings and Loan as a teller,and at John Rouse Construction as a stenographer. She loved playing games with her grandkids, sewing, knitting, crocheting, baking cookies and pies, she was an avid reader. Contributions can be made to the United Church of Richville or Maple Grove Cemetery.